Hyderabad:Don’t be complacent. Strive hard. 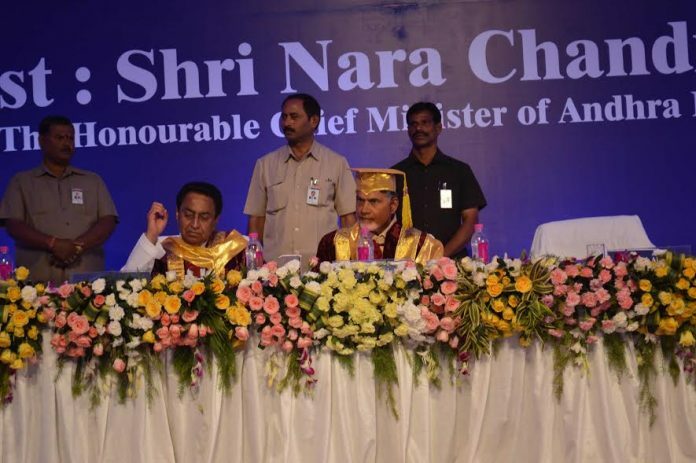 Be innovative said Chandrababu Naidu, while addressing the students at the IMT Hyderabad’s 5th Convocation held here in city at its Campus in Shamshabad near Rajiv Gandhi Airport. Naidu was the Chief Guest at the Convocation. You are more educated than me in management. But, I am more practical in execution than you. Complacency doesn’t work. People in Dubai are complacent. They are happy with what they have, Naidu told 1000 plus gathering of students, parents and invited guests. India is the best place for work in future. US, China and India are going to be economic super powers of the world. India will be number one economy very soon. You need to be innovative to come up in your life. In 1994-95 I have imagined that Knowledge Economy would be future and I saw that in Information Technology and gave it a priority. Rest is the history, he said. Speaking further he added that he has no grievances about bifurcation. It gave me to start a fresh. Every crisis is an opportunity. I have created Hyderabad. Now we got an opportunity to build Amaravathi, which is a rare opportunity. We will make it number one 1 among the top five cities in the world. Adding further he stressed upon Indian values. People in western world have mechanical relationships. In China they are permitted to have only one child. Old aged parents live separately and feel lonely. India is the only country which has stronger family bonding. Happiness comes only with the family he said. And he told the graduating students to protect values. Addressing the media immediately after the convocation, Naidu told that AP has attracted nearly 50 prestigious institutions, both private, government and through PPP model. These include IIT, IIMs, SRM, VIT and many other. When asked if IMT would expand to AP, he said they are taking a cautious approach, he told. Institute of Management Technology (IMT) – Hyderabad is the premier Business School located in sprawling 30acre Green Campus. Awards of Diplomas were presented to 172 students of PGDM . It’s not just profits that count, but how much value is created for the community matters, Kamal Nath said. IMT Hyderabd is one of the best Business School in India said Dr. Satish Ailawadi, Director ofIMT Hyderabad.It is the fourth and the youngest IMT to be established. Good advantage that, 15% of the sessions in the regular courses are conducted by practitioners from different sectors of business. The Industry centric approach is reflected in its curriculum, pedagogy and internship programs, he added. According to Director, Dr. Ailawadi, the Industry centric approach has paid them well. For the batch 2015-17 more than 95% student have already been placed in various places with highest CTC INR 22.5 Lacs per annum. The average remuneration for top 100 students has been close to INR 7 lakhs while average for top 50 offers has been 8.16 lakhs so far. Recruiters like Arcesium, a division of D.E.Shaw, which provides tech support and software solutions to asset managers, KPMG, Deloitte, Amazon, HDFC Bank, ICICI, SBI Life, Syska, Blue Star, CCD, Khmimji Ramdas, Nephro plus, Fact Set, Care Ratings, S& P Global, iNautix visiting the campus with multiple offers during placement session.